With the season done, we're back to this. Top 12 skaters at Worlds have 2 spots guaranteed, and 1 spot per top 24 SB/WS. I'm actually really curious who's going to go where, what with the rule of top 3 at Worlds cannot meet and on the other hand, peeps like Boyang and Yuzuru of course, or in the ladies, Zhenya, not falling under that rule. I guess technically none of them have 2 guaranteed spots but yeah. I am also very curious to see if the IdF rumor pans out for Zu though personally I'm hoping it doesn't. NHK is still the best bet for him IMO. World Standings for purposes of GP assignments for the 2018/2019 season need to be estimated as of July 1st (beginning of next season) since the current World Standings won't be the ones used for GP purposes. Note: If any of these skaters retire, then the next skater in placement moves up and so forth until all 12 places are occupied again. There are 72 spots for men (and ladies?) on the GP. Once the top 12 at Worlds all have their two assignments (24), that leaves 48 spots to be handed out. The top 12 from Worlds will likely be in the Top 24 Season's Best, so they already have their assignments, leaving a bunch more for all the skaters only guaranteed 1 spot. The interesting thing here is that Yuzuru, Evgenia (and Sui/Han in pairs) will be able to be assigned to compete against basically anyone, because they're not seeded from the Top 12 at Worlds. We may be seeing a few head to heads early in the season, like it happened last season. Also, with the top 3 being given first choice most time, unless it interferes with a host's pick, I wonder what Nathan, Shoma and Mikhail will choose and what of their choices will be met. Nathan will obviously have SA and Mikhail CoR. Will Shoma finally get NHK? 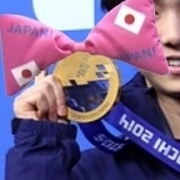 And if yes, will JSF allow Yuzuru there as well? Strategically it doesn't seem smart but this is the Fed that sent 3 of their top ladies to CoC to fight each other off a GPF spot. Or will they prefer Yuzuru at NHK (since he hasn't done a competition in ages in Japan) and have Shoma choose other two assignments? Yes, 72 for the ladies as well. I really wonder what'll happen to NHK and Yuzuru. The thing about the potential deal with the French is that if Zu ends up at NHK and IdF then it's sort of a question mark for Shoma. Yes, they could both go to NHK but IMO the last season's lunacy with the ladies was more an ill thought out idea to let them duke it out, while protecting Satoko, for that second spot so it wasn't really guided by anything else. And yet, if Zu goes to NHK and IdF and Shoma isn't at NHK then what? He cannot go to CoR or SA. That leaves us with SC and CoC but those are back to back. While I don't think he would mind the competitions, he does have jet lag issues so I don't think that works for him. If Zu does his standard SC and NHK then that sort of solves the problem, as Shoma can then do CoC and IdF. If Zu doesn't do NHK at all, then it could be SC and IdF because though CoC and HNK are back to back again, Shoma wouldn't have jet lag issues. So Kazuki get to go to two comp? Where did this rumour that Yuzu is going to IdF come from? Yes, that came straight from the French fed and Didier, how apparently there's a 'suggestion' that P/C and Zu should basically swap so we'd have IdF and NHK for them. Of course I have no idea how much of it is a suggestion and how much a 'suggestion' but it really isn't ideal if he's doing NHK as we can see. Ehhh, news is from the French fed so ... let's say it's their side of the story? I mean they'd want Zu there of course, for obvious reasons but it doesn't mean JSF is forcing him into anything. They could ask him if he's willing, and he might be, and of course, this type of swapping isn't unusual. Stronger 'suggestions' though are not pretty but heck, we don't know. Could be either one. IdF is too close to gpf anyway wish Zu heal his foot soon. Yes! I have a few men to look forward too.